Sensory organs allow C. elegans to detect a variety of chemical, odorant (gaseous), thermal and mechanical cues in the environment (see Nervous system - Sensory neurons). Many sensory neurons directly contact the environment through pores in the body wall or head cuticle. The neurons composing the anterior sensilla include 12 inner labial (IL) neurons, 6 outer labial neurons (OL) and 4 cephalic neurons which are all arranged on the lips surrounding the mouth (see Neuronal support cells - Specific sensilla). In addition, 24 paired amphid neurons project ciliated endings to channel openings in the cuticle which are located laterally to the lips, or have ciliated endings that are embedded in glial cells close to those openings. Finally, 2 deirid neurons extend nerve terminals into internal cuticle layers near the start of the alae, at the same A/P level as the excretory pore. The structure of the anterior sensory organs has been examined in dauers by Albert and Riddle (1983). Although the dauer body wall cuticle is thickened and reinforced, several of the cuticular pores remain open, or partially open, to the environment (DNeuroFIG 1). However, certain neuron cilia undergo shape changes that make them more functionally remote from these openings. DNeuroFIG 1: Depiction of L2 and dauer noses. A. Illustration of external structures associated with anterior sensilla in the L2 and dauer nose. B & D. Scanning electron micrographs of L2 nose with lips containing IL2 sensory endings. C & E. Scanning electron micrograph of dauer nose showing closure of the lips and retraction of the papillae. B-E. (Adapted from Albert and Riddle, 1983.) (A) indicates openings of amphidial channels in the L2 and dauer noses in B, C, E. (Arrowheads) indicate everted papillae in L2 nose in D.
Additional sensory cells lie in the tail, including the phasmids and tail whip, which are not yet characterized in dauers. 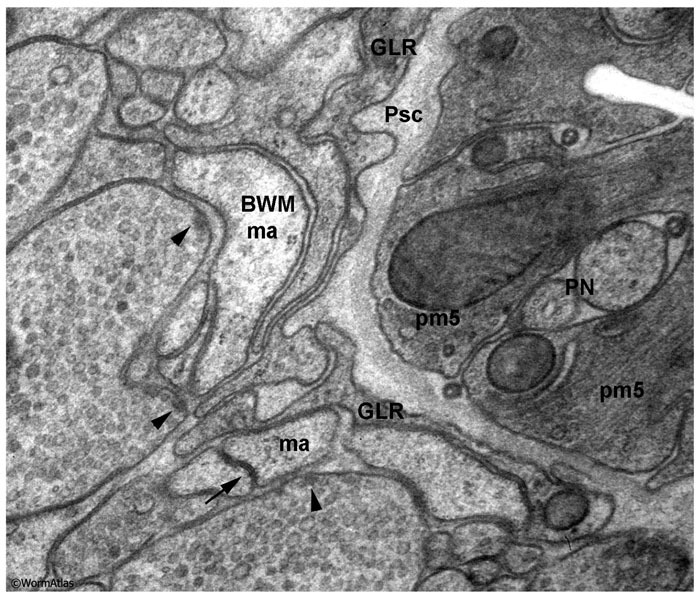 Sensory neurons lying within the bodywall, including the touch neurons (ALM, PLM, AVM, PVM), the post-deirids, and the harsh touch neurons (PVD, FLP) are also uncharacterized as yet by electron microscopy for dauers. The amphid sensory organs are bilaterally symmetric and are composed of 24 paired neurons. Eight pairs of chemosensory neurons extend ciliated dendrites into two amphid channels in the cuticle located laterally at the sides of the mouth. (See also Neuronal support cells - Amphid sensilla.) The amphid channels are technically “open” to the environment in both dauers and nondauers, although the channel openings may be clogged by secretions in dauers (Albert and Riddle, 1983) (DNeuroFIG 2). Four more pairs of odor-sensing or temperature-sensing neurons extend ciliated dendrites that become embedded in the amphid glial cells next to the amphid channels, but do not extend cilia towards the channel openings. Their sensory functions may be less dependent on the openness of the amphid channels. In non-dauers, the amphid bundles within the left and right amphid channels each contain 10 ciliated endings which arise from 8 amphid neurons (Ward et al., 1975). Six amphid neurons (ASE, ASG, ASH, ASI, ASJ and ASK) produce single ciliated processes while two amphid neurons (ADF and ADL) have branched endings producing two ciliated processes each. In dauers, the ASG and ASI nerve endings are shortened and posteriorly displaced so that they are absent from the amphid bundles (Albert and Riddle, 1983). Thus, the dauer amphid bundles contain only 8 ciliated endings (DNeuroFIG 3). This stage-specific disassembly of selected amphid cilia is reminiscent of the changes that occur in some mutant backgrounds, where full length amphid cilia are formed by the L1 stage, but then become progressively shortened as the animal matures (Jauregui et al., 2008; O’Hagan et al., 2011). DNeuroFIG 3: Amphid cilia in L2 and dauer larvae. A. Amphid channels in nondauers contain 10 tightly bundled sensory processes (distal segments of the cilia) from 8 neurons, due to branching of ADF and ADL. B. In dauers, the cilia from ASG and ASI are absent from the amphid channels. A & B. 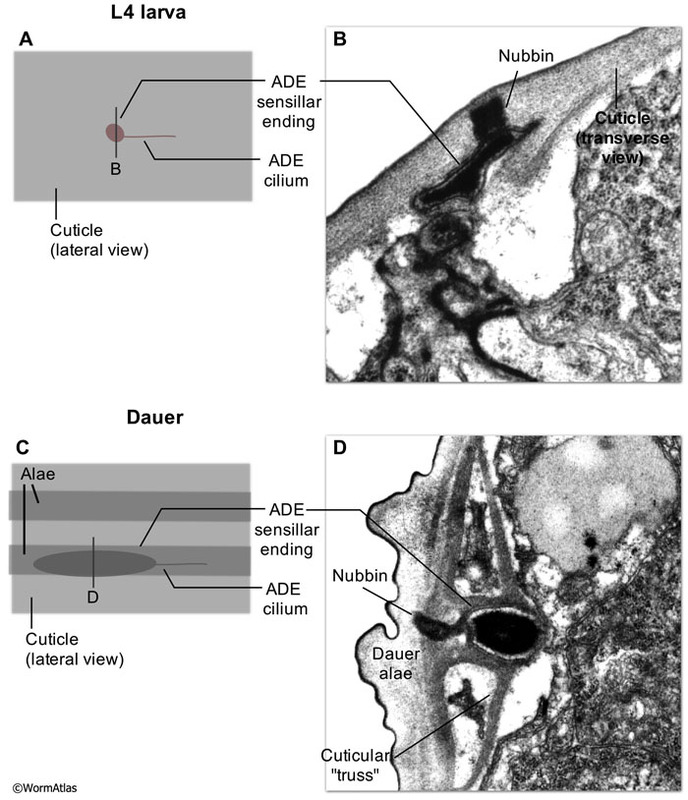 The upper left panel depicts a lateral schematic of the approximate position (arrow) of the transverse TEM section showing the amphid cilia in the upper right panels. Blue lettering in the electron micrographs indicates the identity of each process (archival prints from the Riddle lab). 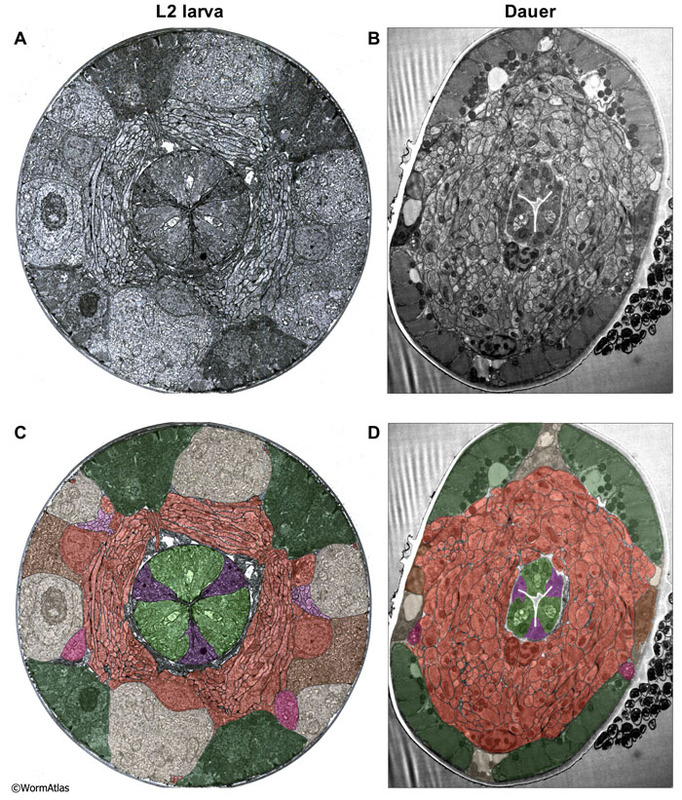 The lower panels illustrate the cilia identities and boundaries within the amphid channel. These relative positions of individual cilia are quite reproducible from animal to animal (Ward et al., 1975). The AWA, AWB and AWC amphid neurons project wing-like ciliated endings within the anterior portion of the nose in close association with the distal swelling of the amphid sheath cell (Ward et al., 1975). 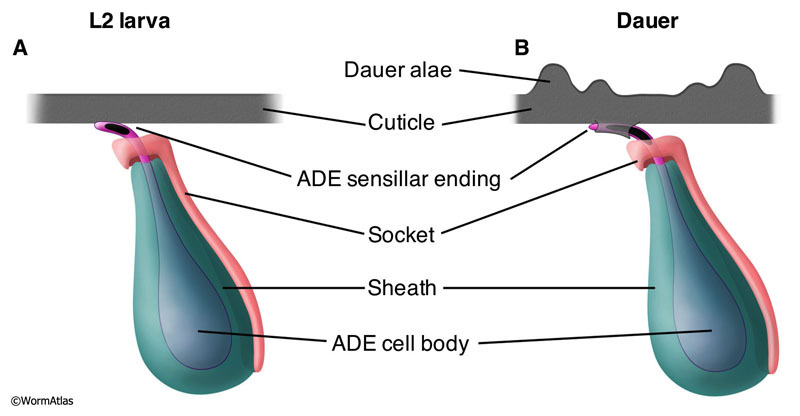 In dauers, the AWC ciliated endings and the amphid sheath cell are both enlarged compared to non-dauers (Albert and Riddle, 1983; Procko et al., 2011) (DNeuroFIG 4). In non-dauers, the AWC winglike processes are located laterally, extending through a 100° arc in L2 larvae and a 180° arc in adults Albert and Riddle, 1983). The distal amphid sheath swells locally and extends laterally to wrap around the AWC endings. In dauers, the dorsal and ventral winglike processes of AWC are radially extended. The dauer AWC left and right processes each extend in a 240° arc, actually enclosing most of the nose circumferentially (Albert and Riddle, 1983). In addition, the distal swelling of the amphid sheath is remodeled so that the left and right sisters fuse at the nose tip. This dauer-specific fusion of the amphid sheath cells is cell-autonomously regulated within glial cells by ttx-1 in a temperature-dependent manner (Procko et al., 2011). DNeuroFIG 4: Radial extension of AWC and the amphid sheath at the dauer nose tip. 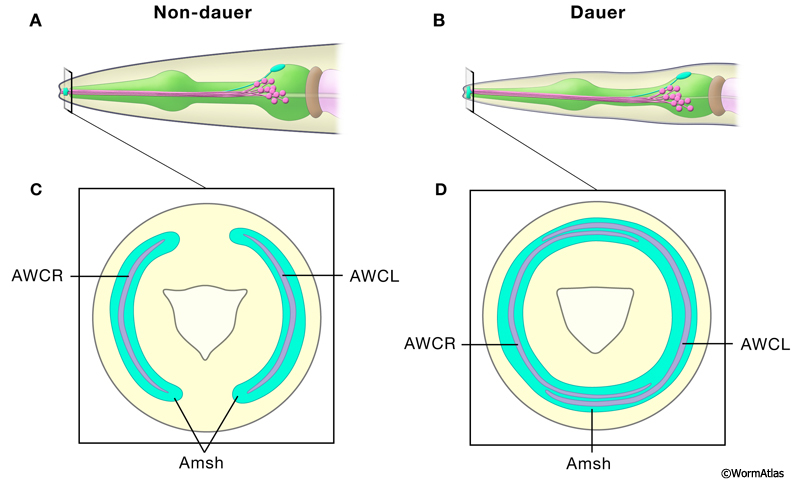 A & B. Illustrations show the location of AWC wing-like nerve endings at the nose tip in non-dauer and dauer animals. Blue arrows indicate the position of cross-sectional illustrations shown in C & D. C. Cross-section illustrating the positions of the AWC nerve endings enclosed in the amphid sheath (Amsh) at the nose tip of a non-dauer animal. The AWC nerve endings extend through a 100° arc in L2 larvae (Albert and Riddle, 1983). D. In dauers, the AWC nerve endings are enlarged, extending through a 240° arc. The two amphid sheath cells fuse at the nose tip in dauers. C & D were adapted with permission from Procko et al., 2011. Each AFD amphid neuron forms a complex ciliated ending consisting of numerous projecting microvilli at the nose (Ward et al., 1975). These microvilli run within individual narrow channels that penetrate the amphid sheath cell swellings in the nose tip. Some investigators have reported that the total number of microvilli is increased in dauer AFD neurons, although this observation has been disputed (Albert and Riddle, 1983; Procko et al., 2011). AFD is important for thermosensation and high temperature stimulates dauer formation (Golden and Riddle, 1984; Ailion and Thomas, 2000). Altered AFD sensitivity could enhance thermal input to the dauer arrest and recovery decisions . Currently, no differences have been noted in the structures between dauer and non-dauer cephalic neurons. In L2 larvae, the distal cilia of IL neurons lie inside channels that penetrate the anterior lip cuticle at papillae which extend from the lip surface (DNeuroFIG 1). (See also Neuronal support cells - Inner labial sensilla.) In dauers, the IL channels may still be partly open to the environment, but contain an overlying layer of an electron-dense material inside the channel, and the cuticular extensions of the papillae are retracted back into the lip cuticle (compare DNeuroFig 1D&E) (Albert and Riddle, 1983). The IL channels bend and narrow to radially traverse the cuticle in dauers, while they project straight and open to the tip of the lips in non-dauers (Albert and Riddle, 1983). The IL neurons are arranged in pairings of two neuron types, IL1 and IL2, which are located on each of the 6 anterior lips surrounding the mouth (NeuroFIG 33). In nondauers, the IL2 nerve endings project more anteriorly of the IL1 cilium, extending to the channel opening. In dauers, the IL2 ciliated endings are recessed compared to their position in L2 larvae, while the IL1 neuron structure is preserved (DNeuroFIG 5) (Albert and Riddle, 1983). Repositioning of IL2 places the IL1 cilium in an equal position within the IL channel, so that neither extends to the channel opening. In dauers, the lateral IL sensilla differ from the subdorsal and subventral sensilla by slightly recessed endings (Albert and Riddle, 1983). 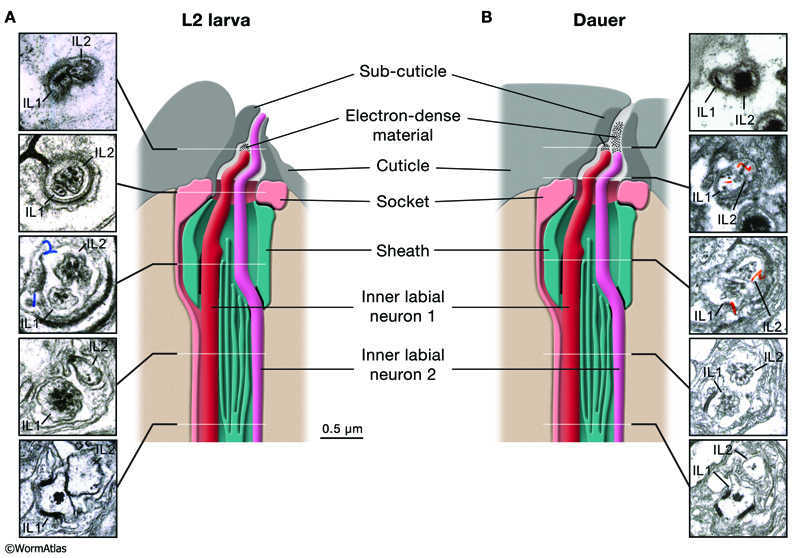 The entire subcuticle structure that surrounds and supports the IL channel is withdrawn into the lip cuticle in the dauer larva, in comparison to the L2 larva. This retracted subcuticle must correspond to the change in IL papillar structure when viewed by SEM (DNeuroFIG 1&5). This shift might lead to a subtle pinching of the channel opening itself. Taken together, these features would predict that chemical signals will be transmitted more poorly to IL cilia of the dauer. DNeuroFIG 5: Repositioning of the dauer inner labial neuron endings. A. Left panel illustrates the positions of the IL1 and IL2 neurons in an L2 larva. Right panels are transverse TEM sections of the IL channels at the approximate positions indicated on the illustration. (Image source: N2 L2 28-14 [D. Riddle] 6, 11, 15, 18 & 26.) B. 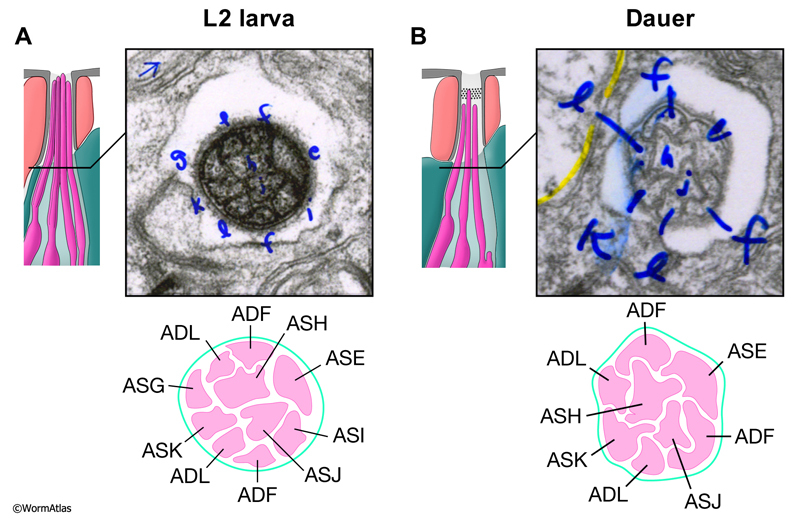 Left panel illustrates alterations in IL structure in dauer larvae. Right panels show transverse TEM sections of IL channels from a dauer larva. (Image source: N2 starved dauer 50-2-1 [D. Riddle] 15, 22, 30, 39 & 44.) The cartoons are modified from Ward et al. 1975. The anterior deirids are mechanosensory sensilla positioned bilaterally in the head near the region of the excretory canal (Ward et al., 1975). (See also Neuronal support cells - Anterior and posterior deirid sensilla.) The deirid consists of the dopaminergic ADE neurons, socket and sheath cells (NeuroFig 37). The deirid sensillum extends to the cuticle, but does not penetrate it. The sensillar ending is a cilium whose swollen distal tip contains an electron-dense material (“tubule associated material”, or TAM) found in several other mechanosensory neurons in C. elegans and other species (Perkins et al., 1983). In addition, an extracellular dense material, the nubbin, helps to anchor the cilium to the body cuticle. In dauers, the deirid sensillar endings are substantially enlarged with a broader, longer region of electron-dense material (TAM) embedded in the distal tip of the cilium (DNeuroFIG 6) (Albert and Riddle, 1983). The electron-dense sensillar endings are also re-oriented to run in parallel to the alae (DNeuroFIG 7). This remodeled structure contrasts with the shorter length and tangential orientation of the sensillar endings in non-dauers (DNeuroFIG 7 and NeuroFig 37). In dauers, a novel cuticular structure, resembling a truss, underlies the enlarged sensillar ending (Albert and Riddle, 1983). This enlargement of the deirid sensory ending and its enhanced cuticle anchorage may improve touch sensitivity as compensation for the dauer’s thickened, stiffer cuticle. DNeuroFIG 6: Enlargement of dauer anterior deirid sensillar endings. A. Cartoon depiction of nondauer anterior deirids, transverse view. The ADE sensillar is filled with TAM, an electron-dense material, and is situated in close proximity to the cuticle. The sheath and socket cells which enclose the ADE cell body are shown. B. In dauers, the ADE sensillar ending is lengthened and affixed to the cuticle by a unique truss-like structure. The region of contact between the ADE ending and the cuticle is more extensive in dauers than in non-dauers. ADE’s mechanosensory role suggests that these adaptations may improve touch sensitivity in the dauer. At first glance, the dauer nerve ring appears to preserve the morphology seen in nondauers. Serious attempts to reconstruct individual cells or their synaptic specializations in serial sections are lacking. In cross-section, the nerve ring fills a much larger proportion of the dauer head volume due to shrinkage of the dauer hypodermis, seam cells and pharyngeal cells (DNeuroFIG 8). Individual axons within the nerve ring seem at least as large in cross-section as those in the L2, and at higher magnification it becomes clear that they are filled with synaptic vesicles and connected by chemical synapses and by gap junctions, suggesting that dauer neurons are fully capable of synaptic communication (DNeuroFIG 9). DNeuroFIG 8: The nerve ring as a proportion of body area in L2 and dauer larvae. Cross-sectional views of the nerve ring in an L2 (A & C) and a dauer (B & D). A & B. Transverse TEM sections of nerve ring and surrounding tissues. C & D. Transparent color labeling of all tissues is superimposed on the TEM sections. Color code for labels: Neuron processes and cell bodies, orange; bodywall muscles, dark green; seam cells, brown; hypodermis, tan; excretory gland, magenta; amphid dendrites, pink; pharyngeal muscles, light green; pharyngeal marginal cells, purple. (Image sources: N2 L2 28-14 [D. Riddle] 1089; Dauer N974 53089 F2 [D. Hall] 048.) The dauer sections are shown slightly enlarged in comparison to the L2 sections. Most tissues are relatively thinned in the dauer, while nervous tissue is not. Differences in fixation technique are not expected to cause any volume changes, since osmolarity has been kept equivalent. The dauer animal has become slightly distorted by the high pressure freeze, and there are some bacteria visible on its outer cuticle. Detailed examination of sensory neurons (above) has revealed specific local changes in individual neuron ciliated endings, including shrinkage or expansion of certain sensory features. A similar study of the nerve ring, nerve cords, and tail ganglia should eventually reveal additional specific changes in synaptic features of identified neurons.